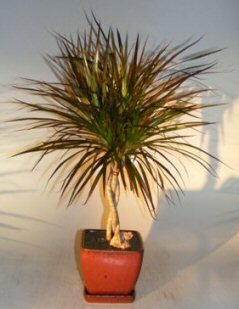 Native to Madagascar and commonly called the Madagascar Dragon Tree. The Marginata has a slender trunk and a near vertical to horizontal mass of narrow pointed green leaves with red to purple stripes along the outer edge. We grow three (3) trees as a braided trunk which will remain permanently shaped as the tree ages. The dragon tree is a very easy-to-care-for indoor bonsai tree. 8 years old, 25" - 27" tall. Shipped in ceramic pot with attached humidity/drip tray as shown. If extra protection is desired, a separate tray can be purchased for $7.95.